In 1945, at the suggestion of Anthony Boucher, who was then the mystery fiction reviewer for the San Francisco Chronicle (but would later move on to cover the same ground for The New York Times), Kenneth Millar entered a short-story contest organized by Ellery Queen’s Mystery Magazine and offering $5,000 in prize money. 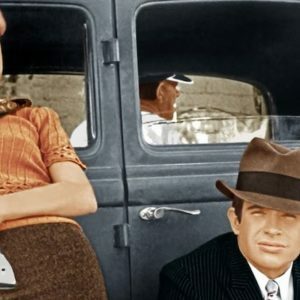 His tale, “Find the Woman,” took place partly in Hollywood and turned on the sort of “wandering daughter job” most closely associated with Dashiell Hammett’s Continental Op. Instead of Hammett’s unnamed middle-aged manhunter, though, it starred a younger hard-boiled private eye, Joe Rogers. Millar wasn’t confident of his story’s merits (“Wish it were better,” he wrote to his wife); yet “Find the Woman” wound up winning fourth place in EQMM’s tourney, and $300 in prize money. Millar was then 30 years old. He didn’t know it, but that competition helped establish the course for the rest of his life. He would soon complete his maiden detective novel—The Moving Target, released 70 years ago yesterday—and then go on, under the guise of “Ross Macdonald,” to deliver 17 more books featuring Lew Archer, the savvy, determined, and compassionate Los Angeles gumshoe who was Rogers’ successor. Those dramatically told but often gracefully wrought yarns made post-World War II Southern California—its suburbs as well as its cities—integral to their plots. They were socially conscious works, deftly exploring the fractured confluences between wealth and want, and between generations in a fragile society that continually finds its moral certitude under assault. As the series grew, Archer—a self-analytical character whose foremost investigative talent may have been his ability to listen without strict judgment—probed not only the consequences of criminal behavior but also its psychological and emotional underpinnings. 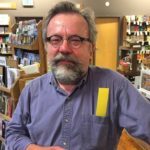 “By any standard he was remarkable,” Tom Nolan raves of this crime novelist in his top-class 1999 book, Ross Macdonald: A Biography. Nolan—a former child actor turned L.A.-area journalist, who since 1990 has been The Wall Street Journal’s mystery fiction critic—didn’t reach that opinion without effort. To prepare his account, he spent most of a decade interviewing people familiar with both the public and the very private sides of Macdonald, and pored through correspondence, notebooks, and other materials his subject left behind when he died from Alzheimer’s disease in 1983 at age 67. Since the biography appeared, Nolan has furthered his Macdonald scholarship by, first, collecting three of the author’s previously unpublished pieces of short fiction in Strangers in Town (2001), and then compiling, in 2007’s The Archer Files, all of the Archer short stories (plus fragments—like this one—of unfinished yarns). With Suzanne Marrs, Nolan edited Meanwhile There Are Letters (2015), which gathered together hundreds of revealing missives Macdonald exchanged with Pulitzer Prize-winning Mississippi author Eudora Welty between 1970 and 1982. And most recently, Nolan edited the Library of America’s three-volume set of Archer mysteries, 11 novels in total. Two decades after my initial interview with Nolan, I talked with him again about the writer whose life and labors he now knows so well. J. Kingston Pierce: When your biography of Macdonald was first published, the author had been gone for only 16 years, and was still easily recognized even outside the genre. It seems, though, that he’s since lost some name familiarity. And there have been many other mystery and crime fictionists stepping up to steal the limelight. Do you think Macdonald’s reputation is as solid now as it used to be? Tom Nolan: It’s inevitable that new authors with evolving careers will draw more attention than deceased ones; and that current readers will likely be more aware of the works of Dennis Lehane and Laura Lippman, say, than of James M. Cain or Patricia Highsmith. I think Macdonald is actually doing well in terms of legacy recognition. Several major essays on his work have been printed in leading journals here and abroad in the past few years. Kevin Avery, with Jeff Wong, created a beautiful book from the late Paul Nelson’s interviews with Macdonald [It’s All One Case: The Illustrated Ross Macdonald Archives, 2016]. 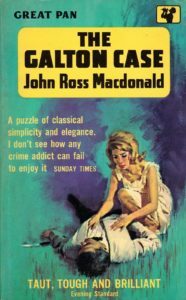 All Macdonald’s novels are available in handsome editions in the U.S. and the UK and other countries, including three Library of America volumes whose publication (and good sales) prompted much critical appreciation. His work continues to impress and inspire another generation of authors as diverse as Jonathan Lethem, Amor Towles, and Donna Leon (whose enthusiastic praise of Macdonald’s style has been notably articulate: in Publishers Weekly, she compared his sentences to Alexander Pope’s). I think in some ways his reputation is stronger now than it was at his death; it isn’t tainted, as it was in the 1970s, by the backlash engendered by certain reviewers resentful of plaudits given by the likes of The New York Times Book Review to a mere mystery-writer. His popularity now, or the esteem in which he’s held, represents a second success, in a way: the firmer success of posterity. Macdonald’s work, I suspect, will be read long after that of a lot of other writers whose mainstream breakthroughs his own popularity paved the way for, and who sold many more books than he. 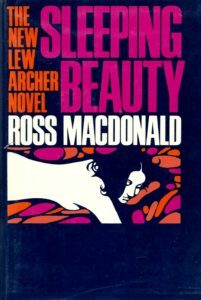 Discerning readers and writers will always be discovering Ross Macdonald; he’s just too good to ignore. Which do you believe were his most important novels, in terms of their lasting influence on detective fiction? The Doomsters  marked the point when Archer began trying to understand and serve people less as a detective and more as an empathetic human being. The Galton Case  he referred to as the fulcrum upon which all his later work would turn; it’s perhaps the first novel in his fully mature style. The Chill  is arguably his most perfectly realized book. The Zebra-Striped Hearse , Black Money , The Underground Man —classics all. Sleeping Beauty  is my personal favorite. That’s a surprise: Sleeping Beauty, which focuses around a disastrous coastal oil spill and a missing, possibly suicidal young woman, is not typically so acclaimed. What about that penultimate Archer tale do you find remarkable? I love the spare beauty of the prose, the permeating melancholy, the fairy-tale imagery and parallels; the dreamlike feel of time standing still; and how Macdonald turns the hourglass upside down to give Sleeping Beauty a second chance. You don’t mention The Moving Target among Macdonald’s most notable works. Although that book is tougher and more cinematic than some other Archers, doesn’t it give us clues about what’s to come? 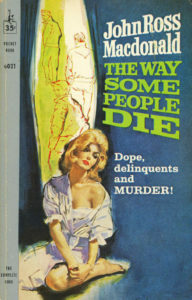 Target was consciously written in the Hammett-Chandler hard-boiled mode, though even this first book bore Macdonald’s own stylistic stamp. He more and more saw what a good vehicle the first-person private eye novel provided for exploring personal material at a distance of one-step-removed. By the time of The Doomsters, he had moved quite a distance away from his predecessors’ gangster-ridden turf and into the suburbs of family dysfunction. Speaking of personal material, we know from your biography that Ken Millar had a troubled childhood. He grew up poor and virtually fatherless in Canada; was lonely and always felt like an outsider; and as a boy expressed his anger through fisticuffs and theft. We know, too, that in 1956—following a fatal hit-and-run accident involving his often-misbehaving 16-year-old daughter, Linda Jane—the author suffered severe stress and entered into weekly psychiatric treatment. Did he take that step principally to help Linda, or also as a way to drag his own demons into the light? He knew he needed help, and he felt it was time he addressed the youthful pain and perceptions he’d been avoiding and suppressing for decades. Earlier, when Linda was in jeopardy and under medical care, Millar wrote a long biographical document, “Notes of a Son and Father,” intended for Linda’s doctors to read in hopes it might aid their treatment and defense of her. The analysis he himself undertook, circa 1957, was for his own benefit (and peripherally, of course, for the benefit of those with whom he’d interact). Hadn’t he always been interested in psychiatry? Certainly he’d read lots of such texts, from high school onward. But reading is one thing, analysis under a smart and probing analyst quite another. I suspect Ken worked as hard on his analysis as he did on his dissertation [about British poet Samuel Taylor Coleridge], his plot notebooks, and his novels. The important thing with analysis, he told a friend, was to do it with someone intelligent who could stay one step ahead of you. 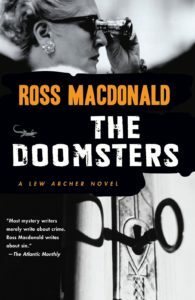 The Doomsters was the first novel he penned after that. Did it grow principally out of his psychiatric self-explorations? That book, if memory serves, began as a novelette (“The Angry Man”) written for but never submitted to a magazine such as Manhunt or Ellery Queen’s Mystery Magazine. (It was eventually printed in the posthumous collection Strangers in Town, and then in The Archer Files.) He expanded it into a novel begun as he underwent therapy, and psychological insights generated by the analysis no doubt made their way into this book. Three years after her car accident, Linda Millar—on parole and under psychiatric care—disappeared from her dorm room at the University of California, Davis, setting off a police hunt that led her father to appeal through the media for her return home. She was finally found with a man in Nevada, but the weeklong odyssey left Macdonald mentally exhausted and sent him into the hospital. How did those two family traumas involving Linda ultimately change the stories he wished to tell? 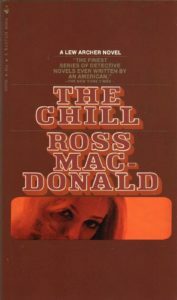 Linda’s troubles irrevocably altered Ken Millar’s life and Ross Macdonald’s fiction. The Millars went from being a somewhat sociable couple with a comfortably sized circle of friends to an almost reclusive duo who rarely asked anyone to their home. Ken and Maggie’s remaining years were deeply shadowed by Linda’s accident, and by her disappearance, and then her early death [in 1970 at age 31]. Their novels reflected these events. Oddly, before Linda’s accident, Ken’s books (and notebooks) were preoccupied with the notion of fatal hit-and-run incidents. After her accident, he developed a new recurring fiction concern: the adolescent student disappearing from college. In the first stage of his career, Macdonald said it was not the detective who was the character of primary importance in his books but the villain. In later years, he said the crucial character was the victim. Wasn’t writing fiction a way for Macdonald not only to examine his demons and perceived errors in life, but also to imagine how he might have dealt differently with turning points? I remember you mentioning to me once that young men in his stories, those most beset by anxieties and conflicts, were often paired with others who’d taken different paths, as if the author was examining two sides of his potential. Where can an example that be found? Lance Leonard, the athletic young tough and would-be movie actor in The Barbarous Coast , who comes under the wing of hoodlum Carl Stern, seems to be a “there but for fortune” picture of what Ken thought he might have become had he kept hanging around the Kitchener, Ontario, pool hall instead of being able to go to college. This character is in contrast with George Wall, the foolish but sympathetic Canadian insistent on salvaging his unpromising marriage. Millar experienced his own quarrelsome marriage with fellow mystery writer Margaret Millar, who, if I interpret your account correctly, possessed both a fierce temper and a fragile ego, and resented her husband’s closeness with daughter Linda. Do you see their relationship reflected in the Archer yarns? Was there much professional rivalry between Macdonald and his wife? Macdonald liked to say they shared a “friendly and healthy” competitive spirit. They were both proud of the other’s achievements—and/but they did keep count of how many books each had published, with Ken Millar picturing himself as the tortoise who in later years might be able to draw even with and maybe even overtake Maggie’s hare. Maggie wasn’t the only person from Macdonald’s real life who became an inspiration for characters in his stories. The woman on the lam in Sleeping Beauty, Laurel Russo, was evidently based on Linda. You wrote in Meanwhile There Are Letters that Macdonald’s 12-year epistolary relationship with Eudora Welty, begun in 1970, helped him come to terms with his daughter’s demise. Was that because the never-married Welty offered him some sort of emotional succor that was beyond Margaret Millar’s capacity? Yes, I think you’ve summed it up well. I suspect he could not talk easily about Linda with Maggie, strange as that may sound. Miss Welty was also, I believe, the only correspondent to whom Ken confided he was losing his memory. You’ve now been studying and writing about Ross Macdonald for three decades. What do you still not understand about him? Or put another way, what would you most like to learn from him, were he still alive? I’d ask for more specific information about his 1950s suicide attempt. “Defenestration” was what he gave as the method of his attempt at suicide, in “Notes of a Son and Father.” It’s not known (to me) what it entailed or how serious it was. It’s interesting to note that in Millar’s very first novel, The Dark Tunnel , someone is killed by being pushed out of a window. 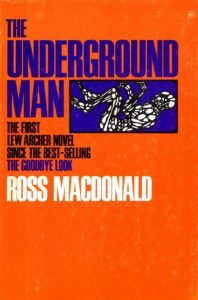 So have you finally written enough about Ross Macdonald? I don’t have any Macdonald projects now per se, but neither can I claim to be done with him. We’ll see.